Hey everyone! 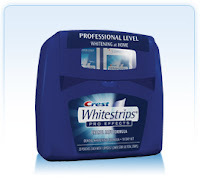 A couple of months ago I decided to try the Crest White Strips Pro Effects, and I loved them. These strips are Crest's highest level of whitening, and I saw results within 3 days of using them. You apply the strips for 30 minutes twice a day for 10 days. While using the strips, I did experience a lot of sensitivity in my gums and teeth. My gums hurt so bad by the third day! Not everyone deals with sensitivity, but the results that I got was worth the pain. My teeth got significantly whiter each day, and many people comment on how great they look. I dealt with the sensitivity by applying the strips once a day, and sometimes I skipped a day. The results are the same, but it just takes longer. I think you are supposed to do the whitening treatment twice a year to retain your white smile. I actually never got around to using all my strips.. So if they can get any whiter then that's amazing. The price is $4o, but you have to realize professional whitening costs hundreds of dollars more! Keep your mouth shut while you are wearing the strips! You don't want a ton of saliva to build up in your mouth. When you wear the strips, rub your teeth occasionally to get rid of the air bubbles that form. After removing the strips, rinse your mouth out with water and wipe your teeth with a Kleenex to get the sticky stuff off.